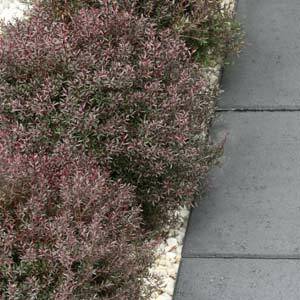 A dwarf tea tree with red flowers, Leptospermum scoparium Nanum Rubrum makes an exciting alternative as a low care border or hedging plant. This is a low shrubby Leptospermum cultivar and with very attractive red flowers and good burgundy to red foliage makes an excellent feature plant in a rock garden, or can be planted at around 75 cm apart to form a border. The long lasting red flowers appear in masses from winter to spring and this adds colour to landscaping schemes when most needed. Also suited to growing in containers in a sunny courtyard or on a balcony. Once established Leptospermum scoparium Nanum Rubrum is a very low care plant. Water regularly through the establishment period and the first summer, allowing the soil to dry a little between waterings. Use a slow release fertiliser once a year in spring. Mulch around the plant to suppress weeds and maintain a cool root run. If you prune lightly each year after flowering you will maintain a good bushy growth habit with lots of flowers. Height – Will reach 1m in height. Spread – Will spread to cover 1 metre. Coastal conditions – Yes, well suited to coastal areas.